This is the worst update we have to make this post, one that puts finality to Richard’s life but also purpose and meaning. Richard passed away December 30th, 2011. Read about his life on Wikipedia & Matrixsynth. Justin and I are off to NAMM next week and hopefully we squeeze in a few more articles between now and then. We will have word on some gigs we are performing at next week and I will be asking for help for an upcoming European tour. Until then, I present the prolific Richard Lainhart! I started playing electric bass when I was 15, so in a few weeks it will have been 40 years. I was born in Vestal, NY, outside Binghamton (the Forbidden City), and ended up where I am by first going to school in Albany, moving to New York City to find work, and moving to Rockland County to escape the noise and density of NYC. Right now, it’s the Buchla 200e, although I’d really have to include the Haken Continuum as a part of the whole system. The 200e is an extraordinary instrument in its own right, but I think it’s the addition of the Continuum that really takes it to an entirely new level of expression and control. So I’d have to say both are my current favorites, in equal parts. I started my life as composer by recording and manipulating sound on tape, and soon afterwards, in college, was able to work in a series of well-equipped Moog synthesizer studios. My first real compositions were created with modular synths and multitracking, and I got quite adept, if I may say so, at modular synthesizer programming. In the MIDI era, though, I completely gave that up and devoted myself to computers. What you could do with MIDI and computers, especially in live performance, went so far beyond what was possible with modulars that there seemed to be no reason to ever go back. 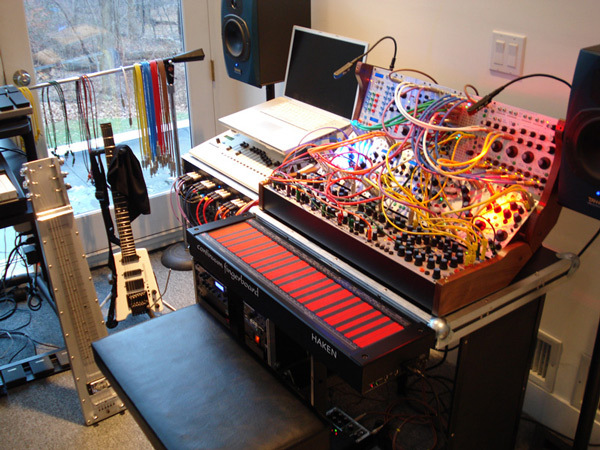 However, when I started working with Jordan Rudess on our live improvised electronic music project, he on MiniMoogs and I on laptops and softsynths, I really came to miss the immediacy and direct expression that he enjoyed working with true analog hardware. In our project, Jordan typically plays his MiniMoogs with one hand on the keyboard and the other on the knobs, and continually generates new sounds as he’s playing – he doesn’t work with presets, but just starts in an open state and goes where the knobs take him. With a softsynth, you have to start from a preset, and have to control the parameters with a multitude of pre-programmed MIDI controllers if you want to approach the same flexibility and ease of expression. And still, there are layers of interface between you and the sound. At the same time, though, I love harmony and polyphony, so a monosynth isn’t for me. And the fixed signal path of something like the MiniMoog does, I feel, limit full expression when compared to a completely patchable system. On the other hand, a standard patchable system isn’t very practical for live performance if you want to work with many different sounds. The 200e is, as far as I know, the only currently produced analog modular synth that allows for polyphony and patch memory, so you can start with a basic patch in performance, and through presets, create many different basic variations on the basic configuration. From there, you can work with higher-level functions like controlling several voices and parameters at once with the multi-dimensional expression of the Continuum, but also lower-level functions like twisting knobs and throwing patchcords around. It’s nearly the ideal system for me, and I’ve come to love it. Adobe After Effects, actually. I work with a lot of music software, including some wonderfully creative apps like Max and Kyma X, but my favorite program is AE. I’ve used it since it first came out, and all my visual work starts and ends there or at least goes through it at some point. It’s the most flexible and creative motion graphics app I know. This studio is the first I’ve had where I’ve been able to set up all my mallet instruments, so just from that viewpoint it’s been a blessing. But it’s also inspiring on other levels, too. My property backs onto a land preserve, which in theory at least can never be developed, and I can’t see any of my few neighbors from the large window that faces the preserve – just trees and sky. I often spend long periods at my desk, just looking out the window and watching the clouds roll by, and I never tire of the beauty of it all. It’s quiet here too, and so I can live in my own sonic world without hindrance. The structures on which I base my music come from nature, and I happen to believe that the best music comes from a calm center, not a position of strife or chaos, so living here has, I feel, been only beneficial to my work. My day job is Technical Director at Total Training Productions, which produces video-based training for Adobe, Microsoft, and Apple digital media software, among others. I used to write all the theme and interstitial music for those productions, and still do occasionally. Other than that, no. I’ve created music in the past for film, commercials, CD-ROM games and magazines, Web sites, and so on, but I’ve pretty much gotten away from that kind of work – I find it increasingly difficult to let others make the final decisions about how the music I create should sound. A really terrible Hagstrom electric bass – the strings were almost an inch off the fretboard, although I didn’t know any better, so I thought it was pretty cool. Fortunately, soon after that I upgraded to a German-made Hofner Beatle bass, which was actually a very nice instrument. Around the same time, my father gave me his old Ampex semi-pro stereo reel-to-reel recorder, which had three heads. The three heads meant that I could do tape echo and sound-on-sound, and I soon started experimenting with running my bass through it and setting up screaming runaway echoes, along with some very primitive multi-tracking. The combination of the electric instrument and the tape deck was what really started me on the path to becoming a composer of electronic music. Very little, really. I’d like a set of 4 matched powered speakers for performance, so I can play in quad (which is what the Buchla is really designed for), but so far, running in stereo and using house systems has worked out well. Beyond that, I have enough to work with for quite a while. A vanderPlas four-octave vibraphone or Marimba One five-octave marimba would be nice, though…. a number of pieces that use that configuration. Finally, there’s the full Buchla/Continuum/MacBook quad system, which includes a Mackie mixer, Niche fader controller, Lexicon MX-400, Roland RE-20, and MOTU 828 in the rack. You can see it in the “Studio Right” image. I’ve been performing a lot with it lately, but moving it around is a two-man job, unfortunately. How Many Locations Have You Had Your Studio? 4 different locations. The first was in an apartment in Albany, NY, and consisted of a Korg DW-8000 and SDD digital delay. I used that for my first album, with a couple of pieces of borrowed gear. 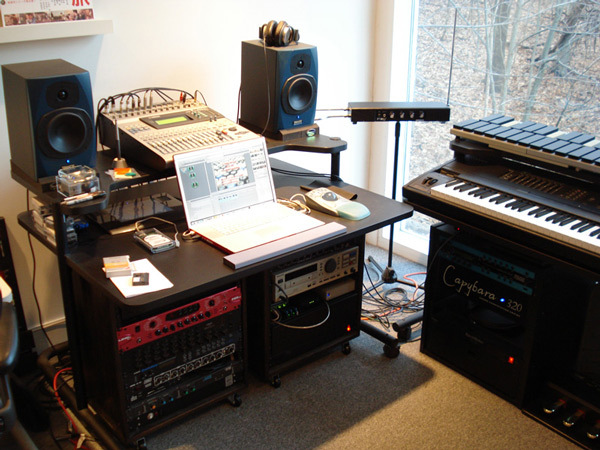 The next was in my house in Albany, and was much expanded with a Mac Plus (running Digidesign Sound Designer, Intelligent Music M, and Opcode Sequencer), 3 Emax samplers, Alesis digital reverbs, JBL speakers, and several delays and reverbs. That was my first performance system, and I used it for my second, unreleased, album. I sold most of it when I moved to New York City to upgrade to a Mac Quadra 900, SampleCell cards, a Yamaha DMP-7 digital mixer, and a Panasonic DAT deck, and used that system for most of the commercial work I did at the time. Then, when I left the city and moved north to Rockland County, I sold it all again to upgrade to a PowerMac and a largely software-based studio. So, basically, every time I moved, I upgraded. Richard is also on the XI Records and Ex Ovo labels.